James Fenimore Cooper, one of Americas leading intellectuals and creative writers, came from a prominent and very active patriotic Federalist family, and dedicated his life to promoting the lofty ideals of the American Revolution, to ensure that these ideals not be lost to mediocrity in future generations. Unfortunately the playwright, Jeffrey Hatcher, whose adaptation of Coopers novel, The Spy, was performed at George Mason University in April, 2009, came nowhere close to Coopers understanding and intention, and wasted of the great talent of the cast. The performers of The Acting Company travel nationwide to bring great theater to a wide audience with workshops and classes, and performances of great classical drama. The acting was excellent, the directing was very effective, the set design and costumes were true to the period; even the lighting and sound effects made the audience feel that they were a witness to history. However, all of the powerful ideas of Coopers novel were diluted and even altered by the playwright. The performance started with all the actors coming on stage to introduce the audience to the neutral ground, the area that frequently changed hands during the American Revolution in Westchester County, New York. The action unfolded as a gentlemanly traveler, Mr. Harper (played by Freddy Arsenault), arrived at the home of Mr. Wharton (Rick Ford), seeking refuge from a violent storm. There he was met by Sara Evans (Carie Kawa) and Frances Wharton (Kelley Curran), who were Mr. Whartons niece and daughter respectively. Soon Mr. Whartons son, now a British officer, Lt. Geoffrey Wharton, (played by Sonny Valicenti) also arrived at the door. The younger Wharton traveled in disguise because of the danger of traversing this political no mans land. He came only to visit his elderly father, but was soon arrested for being a spy in his own family home by the American troops under Major Dunwoodie (played by Matthew Amendt). The young Lt. Wharton managed to escape because of the help from Harvey Birch and Mr. Harper. Harvey Birch (played very thoughtfully by Robert Michael McClure) was an itinerant peddler and the greatest of patriots working as a spy for George Washington, willing to risk his life, his fortune, and his sacred honor for his nation. However, with a very misinformed public opinion of the period, Birch was despised by all, because it was believed that he was eager to sell out his country for British gold. It is common practice for great playwrights and composers to change facts, add characters, and delete sections to enrich the work they are adapting. However, the underlying axioms and the message of the play must be truthful, even as such changes are made. Here, the true secret identity of Birch, which is the great mystery of the novel, was revealed by the playwright before the suspense was even created! In the middle of the play, the cousin, Sara, discovers a secret note from George Washington to Birch, and Sara confronts Birch over it. The anonymity of Birch is the critical element in the novels composition, and to eliminate that, changes much more than the plot. Instead of developing the character of Coopers protagonist, Birch, the American Patriot, Hatcher focuses attention on Lt. Wharton, the British officer, who shows up in almost every scene, with his romance with Sara being a central focus. Also, Coopers character Frances Wharton is a very strong, articulate woman who argues passionately for the American cause, but, Hatchers character is enraged, and acts like a condescending British aristocrat! 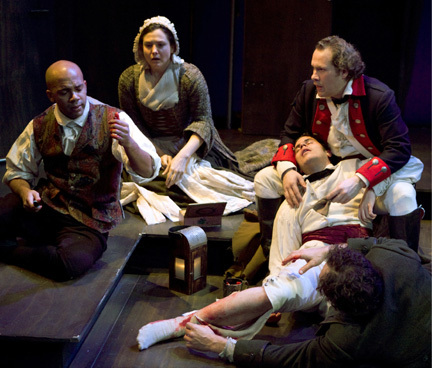 The playwrights only possible improvement upon the novel was the treatment of the only African-American, Caesar, (played by William Sturdivant) who is seen here extracting a bullet from the leg of his master (played by Sonny Valicenti). However, this scene never took place in Coopers novel. Also shown are Georgia Cohen and Andy Grotelueschen. In general, the performers did their jobs competently, but this is not Coopers novel. In the program notes, Jeffrey Hatcher praises the spy novelist, John le Carre, and his ruthless logic. It were better that he study some of Poe, or Schiller, to better comprehend the actual work and method of the remarkable James Fenimore Cooper. Coopers father served under George Washington in the Continental Army during the revolution. After the war, at the request of Washington, and with the sponsorship of Alexander Hamilton, the father would establish Cooperstown, NY as a bulwark against a feared attack from British controlled Canada. Following in his fathers footsteps, James Fenimore Cooper would become a leader in the network of intelligence agents known as the Society of Cincinnati, which worked to protect America, and also bring American ideas to feudally controlled Europe. Cooper worked closely with other Society of Cincinnati leaders such as Lafayette, Edgar Allan Poe, and Samuel F. B. Morse. While living in France, Coopers house became the meeting place for much of Europes republican movement. The British Empire felt the threat of this growing republican upsurge across Europe, and began to flood the literary market with the romantic pulp fiction of the ultra-royalist, Sir Walter Scott, to glorify the good old days of the darkest period of European feudalism. Scotts protagonists were the knights in shining armor fighting for the cause of Europes nobility. To answer this British cultural warfare, Cooper was encouraged by his circle of patriotic friends to write an American novel to show the world a different direction, and his first great success in this effort was the The Spy. It was even the close family friend (and next door neighbor), John Jay, who would give Cooper the basis for the novel when Jay related to him in 1817, the story of a spy under his control in Westchester County, NY. Cooper developed his hero neither as a gallivanting knight nor a James Bond womanizer, but rather as a very humble peddler, whose only attributes were his intelligence and courage. This would be the new American ideal, and it left the aristocratic enemy at a disadvantage, since they were unprepared to deal with people who operated on personal integrity and determination, and not on ones social standing. It may be fitting to conclude here with a quick review of the real spy that Cooper used to model his character, Harvey Birch. Enoch Crosby (1750-1835), an American Patriot, did his espionage work in Westchester and Duchess Counties in New York, and was considered the first secret agent of the country. 1 Crosby was a farmer and part-time shoe maker, who by chance, discovered in September of 1776 that a band of Tories was forming. Crosby was able to win the confidence of the lead recruiter for the Tories, and pumped him for intelligence, and then reported this information to John Jays Committee of Safety in White Plains. The Committee asked Crosby to lead some mounted rangers, and they were able to surround and then arrest all of these Tories. Although Crosby enlisted in the militia three times, it was John Jay who pulled him out of regular army duties to use Crosbys unique skills at undercover work. Jay thought the biggest threat to the nation came from our secret enemies. As John Jay was preparing for his diplomatic mission to Spain, he tried to pay Crosby for his long, dangerous months of undercover work, but was surprised when Crosby refused the money, insisting that the country needed it more than he. Before Cooper wrote this novel there was a myth that no American would read a book unless it stated Printed in Great Britain. His novel was a big literary gamble; not only did it focus attention on the origins of American culture and manners, its very moral protagonist comes out of the sometimes unsavory world of espionage. However, almost over night Cooper became the most widely read author in the world and it is believed that only the Bible had a higher rate of penetration into American home book collections. The Spy was soon translated into French, German, Italian, Spanish, Polish, Russian, Hungarian, and even Farsi, and it seemed that the entire world was eager to understand the American outlook and personality. The composer Franz Schubert, as he lay dying in Vienna, requested that his brother bring him the newest Cooper novel, so he could read it. In Italy, Paris and Warsaw, thinkers and patriots were studying Coopers writings, to learn the lessons of statecraft, history, and America. Mr. Hatchers adaptation missed the mark.